Eateries include Roy Yamaguchi’s latest; organic shave ice; and a satisfing street burger. This year has seen the opening of a variety of new, fun eateries along Kauai’s southern shore, from Roy Yamaguchi’s newest hot spot to a seasonal, organic shave ice stand with a mustache theme (yes, really). Here’s the scoop on three new places to try. Celebrity chef Yamaguchi’s newest restaurant celebrates Hawaii’s culinary past. Even the name is a nod to one of the islands’ first restaurants, Peter Fernandez’s Eating House, which opened in the mid-19th century. The stylish new restaurant, tucked into Koloa’s swanky Shops at Kukuiula center, is a high-ceilinged, rustic-chic affair with wood floors, clean lines and a menu that celebrates local ingredients. The offerings range from pupus — Rainbow Poke ($18) with Hawaiian ahi, kampachi and salmon, for example, and spicy pork and shrimp potstickers ($15) with a Korean chili vinaigrette — to a spicy ramen bowl with roast pork and shrimp dumplings ($21 and delicious, but anyone with sodium issues should steer clear), a tasty Plantation Paella ($31), local seafood and more. There is a second Eating House 1849 in Waikiki and another scheduled to open in Kapolei on Oahu. Details: Reservations recommended. Open for dinner daily at 2829 Ala Kalanikaumaka Road, Koloa; eatinghouse1849.com. We’re certainly fans of traditional Hawaiian shave ice, but even we find some of those violently neon-hued syrups a bit worrisome. 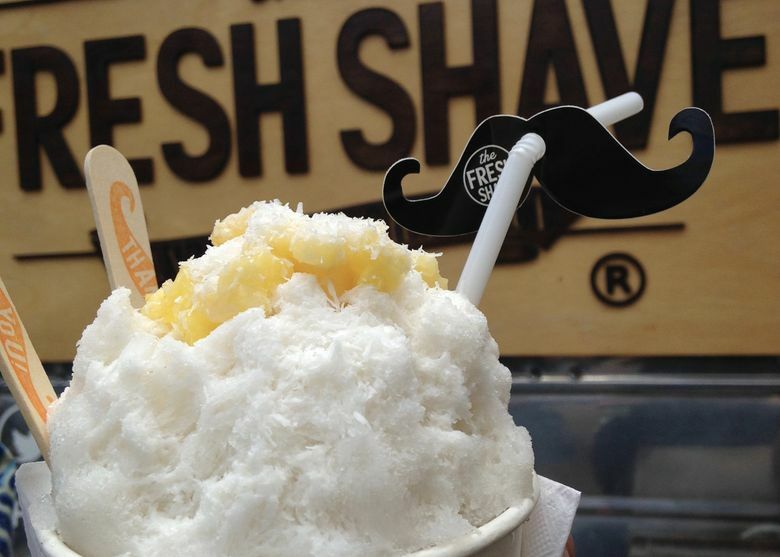 Now Daniel and Priscilla Soule have opened The Fresh Shave, a vintage trailer and food truck that dispenses seasonal, locavore shave ice ($6), all in colors that can be found in nature. Fresh pineapple and shredded coconut top the Handle Bar ($6) while pureed strawberries and chunks of apple bananas grace the Fu Manchu. And the cold brew coffee, mixed with cream and sugar, of course, atop the Dirt Squirrel hails from Lihue’s Ha Coffee Bar. We especially liked the Caterpillar, an orange creamsicle blend of fresh oranges and sweet cream. Even the straws have mustaches. Details: Schedule and location vary, but usually open Tuesdays-Saturdays at 3540 Koloa Road, Lawai, with pop-ups at the Sheraton Kauai in Poipu and other locations. Check facebook.com/thefreshshave for details. There are few things more satisfying than a really great burger. Aaron and Kristin Leikam’s Street Burger serves up spectacular versions in a year-old rustic-meets-industrial spot in Kapaa, 6 miles from the Lihue airport. We’re thinking it should be a must-stop when you land and when you depart and, perhaps, a few times in between. The decor is all distressed wood and Edison lights, and the menu includes salads, burgers and other items, accompanied by 23 craft beers and ciders on tap. You’ll be hard-pressed to choose among the 17 riffs on the burger theme, made from Makaweli Meat Co.’s grass-fed beef, Niihau lamb or house-made veggie patties. We suggest the Bacon & BBQ burger ($15). It’s every bit as good as it sounds, with bacon, cheddar, “fizzled onions” and bourbon barbecue sauce, served with hand-cut fries. Aaron, formerly a chef at Hukilau Lanai and 22 North, even makes his own ketchup. Details: Open Tuesdays-Saturdays at 4-369 Kuhio Highway, Kapaa; streetburgerkauai.com.